The Pale stinian Heritage Foundation is pleased to announce that its Exhibit, "Threads of Tradition: Palestinian Traditional Costumes", which has been on display at the Antiochian Heritage Museum since May 2005, has been extended for an additional six months, to the Spring of 2006. Visitors to the Exhibit have come from as far away as New Jersey, Ohio, Maryland, Michigan and Pittsburgh. During the coming months, the museum is planning special educational programs for local visiting groups, including tours, lectures and movies. On Tuesday, August 9, 2005, PHF Co-founders Hanan and Farah Munayyer were featured in a 15-minute interview on Azzrar, a weekly cultural program broadcast worldwide on Al Hurra TV. The interview was conducted on site at the Antiochian Heritage Museum in Bolivar, PA where "Threads of Tradition: Palestinian Traditional Costumes", is currently on display. The interview covered the items on display and the background history of the research Hanan has been conducting on the history and evolution of the art of embroidery in the Middle East. The program has been very well received throughout the Middle East. Pieces from PHF’s collection were on display at the Mahrajan Al Fan festival held in New York City from November 4 through 6, 2005. Five embroidered bridal costumes representing Jerusalem, Bethlehem, Asduud and the coastal and Naqab regions were included in the display that attracted the attention of many of the festival’s visitors. This year's Mahrajan was a spectacular 3-day festival sponsored by the World Music Institute and the Arab-American Arts Institute. On Friday, Adonis, one of the Arab world's most renowned poets, made a rare New York appearance at the festival. Adonis is admired for his revolutionary and mystical works, and has deeply influenced both his contemporaries and younger generations of poets. Adonis read his poems in Arabic with musical interludes by Simon Shaheen on 'ud. On Sat urday, the program featured virtuoso performers Simon Shaheen on the 'ud, Min Xiao-Fen on Chinese pi'pa, Christopher Morrongiello on the lute and Vic Juris on the guitar. The highlight of the evening was Tunisia's Sonia M'Barek whose soul-piercing vocals resonate with euphoric tarab. Sonia is one of the few female soloists performing maluf (Tunisian court music), which is rooted in medieval Andalusia and closely related to the music Libya, Algeria and Morocco. The Sunday afternoon program offered children's events, colorful Tunisian, Algerian and Al-Andalus folk and classical dances with the Jawaahir Dance Company, storytelling, and crafts, including calligraphy, embroidery and henna painting. The festival concluded with two theater performances: Award-winning Palestinian actor Mohammad Bakri presented his one-man show, Pessoptimist. The second performance, The Details of Silence, written by Nathalie Handal and directed by Cynthia Croot, was a sensual, daring political play that explored the internal and external worlds of Arab women. PHF was instrumental in decorating the theater's stage with Middle Eastern crafts from its collection. PHF has recently acquired an antique embroidered bridal dress from Ms. Jumana Hasan of Ohio. In her letter to PHF, Ms. Hasan wrote: "The dress belonged to my grandmother Hasab Amer Al-Abed who passed away in 1982 at the age of 65. It was given to her when she was married at 16 years of age. She was from El-Bireh Ramallah. My grandfather's family were wealthy landowners, so I guess the headpiece she wore with the gold coins was a sign of affluence. The actual headpiece I believe, was worn on the head, and then the gold coins were attached to it. I do not have that actual headpiece, just the gold coins. The dress will be a wonderful tribute to my grandmother's name." The dress is made of black velvet with a typical Ramallah chest piece embroidered in cross stitch with red silk thread and gold cord. The sleeves have yellow and red taffeta inserts embroidered with Bethlehem couching stitch. No matter what the bridal boutique sales lady tells you, a "traditional" wedding gown is not necessarily ruffled, slinky, lacy or even white. In the Middle East region known historically as Palestine, the bridal gown tradition reaches back 2,000 years. Gowns are black, brown or off-white, or sometimes a brilliant combination of red, orange and hot pink, jingling with silver coins. Like a Scotsman's tartan, a Palestinian wedding dress tells through color, cut and stitching the wearer's native region, village and clan. Hanan Munayyer's collection of knockout Palestinian bridal wear is on display now in "Threads of Tradition: Palestinian Traditional Costumes." The show continues through November at the Antiochian Heritage Museum located at Antiochian Village Conference and Retreat Center, an Arab-Christian gathering place on Route 711 north of Ligonier. The Village is unofficial headquarters for a North American diocese of the Antiochian Orthodox Church, an Arab-Christian congregation with roots in what is now Turkey. Twenty years ago, second-generation immigrants bought the 400-acre church camp and poured more than $20 million into new cabins, a chapel and library, hiking trails and the three-gallery museum space. The galleries host shows of artworks, icons, vestments and furnishings from a variety of Middle Eastern countries and tribes. The antique wedding gowns fit perfectly into the museum's cultural agenda, said events coordinator Sally Richards, because they show an aspect of daily domestic life in a fast-vanishing culture. A visit to the museum is part of the package for young campers who come from all over North America for the summer sleep-away program. "It's surprising to see how many of the kids recognize these clothes from old photos of family members," Richards said. Gowns are made of natural-brown or black linen inset or appliquéd silk, embroidered with ancient geometric designs called Bird of Paradise or Tree of Life. Each town or tribe had its own colors, motifs and techniques; sometimes a coin-covered bridal vest was passed down from bride to bride, a way to ceremonially display the wealth of the entire clan. Up in Haifa, the wedding dresses were white, alive with brilliant red embroidered birds, flowers and vines. Bright red pantaloons peek from under the hem. Men wove the linen in Ramallah, but the bride and her friends embroidered it for months before the wedding. One black dress from the 1930s has a thickly stitched yoke made in Bethlehem, full of expensive metallic thread -- times were good there. But a dress from the 1890s reflects a less than prosperous wedding under Ottoman rule. The cross-stitching is sparse, but this bride still managed to stand out: the silk embroidery thread is dyed lavender purple, an unusual shade for its time. Elaborately embroidered panels were sometimes cut off a worn-out dress and transplanted onto a new garment, or made over into pillow covers or wall decor. A close-up of the headdress. From Asdud and Majdal come shocking pink fabrics, dyed using the seashell extract that made the area famous in Roman times. 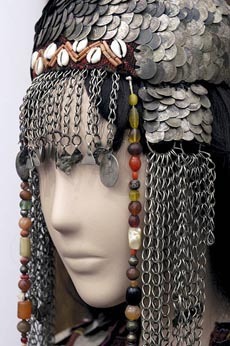 A saffeh headdress is lined with heavy silver coins; another headpiece has detachable silver bangles in cross or crescent shapes, so Christian or Muslim brides could choose the suitable symbol. The bridal wear on display isn't all glitter and flash. Desert-dwelling Bedouin brides wore huge black gowns with severe geometric insets on the shoulders. There were no low-cut bodices, bustles, trains or tulle. And definitely nothing strapless. Hanan Munayyer isn't a dress designer. She and her husband are collectors of cultural artifacts. Both were born in the 1940s in what is now Israel. They grew up in the turbulent days that saw Israel established. In the millenniums since, the same land was renamed and settled by a rainbow of ethnic groups and religious persuasions collectively. Munayyer's collection sidesteps the conflicts that often accompany discussions of the region's recent history. Her collection stops in the 1940s, she said, just before Israel was created in 1948. Mention Fallujah, Ramallah or Gaza to her, and she'll tell you which type of stitching, silk threads, vegetable dyes were used in each area a century ago. Both th e Munayyers are pharmaceutical researchers in New Jersey and avid collectors of now-vanishing antique gowns and ethnic embroideries. Since 1987, they've accumulated almost 400 costumes and 1500 accessories, furnishings, lamps and musical instruments -- things younger generations of Palestinians might not recognize as part of their heritage. Bedouin dresses from the Naqab desert, 1940. "Throughout the '50s and '60s, everyone was married in white, but now I'm seeing more brides -- educated, cosmopolitan women -- honoring their roots by wearing some element of traditional attire," Munayyer said. "I've loaned several newer dresses to brides in the U.S. or in Canada. ... And the Palestinian embroidery workshops in Lebanon still are capable of beautiful workmanship." Munayyer doesn't expect a great surge in ethnic wedding attire anytime soon, she said. Headpieces were anchored in the bride's long, braided tresses, and won't work with a short haircut. Heirloom-quality gowns are hard to find, labor-intensive, expensive and heavy. "They're not comfortable to wear, and they're not very slimming," said Hanan. "By the time you put on all these layers of clothing, belt, veil, headpiece ... even if you're slim, you look like a tent. A really gorgeous tent." (Rebekah Scott can be reached at rscott@post-gazette.com or 724-836-2655. This past summer, almost one thousand campers at the Antiochian Village Camp in western Pennsylvania, got a closer look at Palestinian culture and heritage by visiting the exhibition "Threads of Tradition: Palestinian Traditional Costumes” at the Antiochian Heritage Museum. The tour of the Exhibit was incorporated into the campers’ morning program. The campers spent about fifteen minutes viewing the garments and other items on display. The campers’ counselors encouraged the campers to look closely at the intricate needlework and emphasized the time and care that had been put into creating this attire. After the tour, the campers spent about half an hour in a cross-stitch activity that gave them the opportunity to imitate some of the patterns in the garments, or to create their own design. Some campers even asked for more yarn so that they could continue their projects during their journey home, and other female campers said they would like to wear such bridal costumes at their own weddings. PHF is thrilled to provide the campers with this educational opportunity, and is moved by their interest in the collection. In an attempt to revive old traditions, the wooden chest in which the bride used to pack her trousseau is back in Lebanon, but for decoration and ornament, and not out of nostalgia for this old tradition. Sixty-year-ol d Mahmoud Mohammad Moussa, of Egyptian nationality, brought back the bride's wooden chest to Sidon, after it has disappeared from the scene for more than 10 years. Inside his small atelier in Sidon's industrial city, Moussa transforms wooden boards into a magnificent piece of art. With his chisel, Moussa carves copper plaques in an operation marked by accuracy and refined sensations. The sound of the chisel on copper reminds you of the musician who caresses the violin to bring about a beautiful air. Fabricating a bride's box requires so much time, especially that work is based on hand craft. Moussa said: "I don't like to use modern tools; I depend on my mind and my hands and my work is based on creativity and art." "I concentrate first on the idea through the study of the history of ancient civilizations and then he sketches it and starts carving the copper plaques. Moussa added. "It takes a whole month and lots of patience and serenity to complete the fabrication of the bride's box," Moussa said. Inside his disordered atelier, Moussa works hard to build a box depicting the ancient Egyptian civilization. "This box is my favorite," he said, "It carries the scent of my ancestors." He delivers his works of art to antique shops in downtown Beirut, where his bride's boxes can be sold for about $3000. He said: "When I first started this work, it was like a big risk, considering its costs and the lack of raw material; but the demand of Gulf and African markets made me engage in this adventure." Dear Farah and Hanan, On behalf of Antiochian I want to thank you for bringing your "Threads of Tradition" display to the Village and for all the work you did in getting it ready for the gala. We hope to see you soon. Hi Farah and thank you for the forward. I logged onto the website and found a most impressive review of your great collection. Thank you for your continuous work to preserve our Palestinian Heritage. Regards to Hanan and all the girls. Dear Farah, It's a very nice and informative web site, and the exhibit looks very good. Thanks for your offer of help--we may be in touch in the coming months. The display in the newsletter looks absolutely amazing-it makes me so proud, I hope you will have another one soon in the DC area. I will be there soon. This dress struck my eye, it is incredible where did you get it?? This is a very impressive exhibit. I can tell that it took years of dedication and many days and nights of hard and professional work to put such an exhibit together. If a picture is worth a thousand words, your efforts bring an awareness of the Palestinian culture to the US scene and present a positive picture in the midst of intense negative media coverage about the Palestinian culture. Very, very beautiful, Farah and Hanan. Thank you for your excellent work. I took a look on the July newsletter … again Awafei and God bless you and your efforts. Frankly I am thinking what my Grandmother head dress- Hatta- can lend to your collection, I know only I do not want to donate it. Is there any way to display it under your activities? Great work! Congrats to you and Hanan. Let me know how long the exhibit will be up in PA. I am back in CA and have some work in mid Sept. in NYC, maybe I can get a chance to check out the exhibit. I am sharing your website with friends and family. Dear Sir or Madam, Please add my name to the mailing list for your newsletter. In the September/October issue of the Washington Report I saw the reference to your organization in their glowing review of the Palestinian folk dress exhibit in Pennsylvania. I was glad to hear that the costumes will be on exhibit until the Spring of 2006. I hope to make the trip to Ligonier, PA sometime this fall.